The Ducks have until shortly after the draft to sign Schultz. If they do not, which in all likelihood they won't, Schultz can talk with any team in the league, although he can't officially sign a deal until July 1st. Blake Wheeler went through a similar situation in 2008 after the Phoenix Coyotes failed to sign him, despite taking him fifth overall in 2004, and the Boston Bruins were the benefactors. But like Wheeler before him, Schultz isn’t becoming an unrestricted free agent for money. Schultz must still sign an entry-level deal, which means there will be no real financial bidding war between teams. The maximum contract Schultz can sign is for two years at $925,000 a year with a $92,500 signing bonus. Schultz will undoubtedly have performance bonuses worked into his contract as well, so the max he can earn per season is $3.725 million. Location will be key in the upcoming negotiations. Schultz can now choose where he plays hockey. Instead of having the option of signing with one team, Schultz can choose between 30. He has been compared favourably to Jake Gardiner, but is believed to possess slightly better offensive and defensive ability. He is a tremendous skater and has good offensive instincts. He sees the ice very well and knows when to jump into the play. Corey Pronman, an independent scout who writes for ESPN, says he projects as a top-pairing defenceman. Wisconsin men’s hockey head coach Mike Eaves had a lot of positives to say about Schultz in an interview with The Badger Herald. Schultz is a two-time WCHA Defensive Player of the Year and led all NCAA defenceman in scoring this season with 16 goals and 44 points. 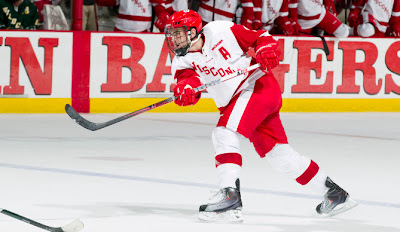 Schultz has scored at over a point-per-game pace in his last two seasons at Wisconsin, and according to Behind the Net, this should translate to about 40 points over an entire season in the NHL. Of course, there will likely be an adjustment period for Schultz before he starts putting up those numbers, just like Jake Gardiner had before putting up offensive numbers with the Leafs during the second half of his rookie season. However, Behind the Net would have also predicted Gardiner to finish his first season in the NHL with 33 points in 82 games, which is exactly the rate he was scoring, so 40 points may not be an unreasonable expectation for Schultz. Plus, as if that wasn’t attractive enough, after completing his entry-level deal, Schultz will be a restricted free agent, despite already having hit unrestricted free agency at such a young age. Schultz won’t become an unrestricted free agent until he turns 27 in 2017. That means he will be under team control for four years. Teams are getting a rare chance to add a second-round pick, already developed—what essentially amounts to a high-quality, NHL-ready prospect—and it won't cost a single asset from their team. It will only cost money. At this point it is pure speculation as to where Schultz will land. On TSN’s The Quiz segment, Bob McKenzie stated he thought Schultz would sign with the Edmonton Oilers. The fit with Edmonton would be great, as it is a young, dynamic team, and Schultz would get a lot of playing time on a relatively thin back-end. Schultz would be a good fit with the Oilers and they would improve tremendously if they could sign him, but Edmonton has a very poor track record of signing desirable free agents. If money is equal between teams players rarely ever sign in Edmonton. To put it bluntly, Edmonton just isn’t a nice city to live in. It gets wickedly cold and there isn’t very much to do outside of watch/play hockey. That’s why Edmonton’s focus has always been building through the draft. Schultz fits the mold of the young, highly talented, and controllable player they would draft, but because this is a UFA signing, I’m not sure Edmonton is a legitimate front-runner. In the same segment of The Quiz, Aaron Ward said Schultz would end up with Detroit and Marc Crawford said Toronto. Some have also suggested Schultz may want to sign in Vancouver because he is originally from West Kelowna, B.C. It’s important to note, however, that people said Wheeler became a free agent because he wanted to sign with his hometown Minnesota Wild, and he ended up in Boston. People are sometimes too quick to make a connection between a player’s hometown and where they will sign, when usually this doesn’t happen. The connection to Toronto is interesting. Schultz was initially a second-round pick by Brian Burke when he was still GM of the Ducks, so there is a familiarity there. Plus, when Burke traded Francois Beauchemin to the Ducks he was initially pressing for Schultz coming back the other way. It was only after being rebuked that he settled on Jake Gardiner, which has worked out nicely as a consolation prize. Accordingly, you can be sure Burke will press hard for Schultz, especially because the defence has been a disaster during his tenure in Toronto. Burke already has a solid track record of signing some of the most sought-after atypical free agents. He signed Tyler Bozak, who was one of the most hyped college free agents at the time, and Jonas Gustavsson, who was a player with a long line of suitors as he was recognized as the best goalie not playing in the NHL. Another thing working in the Maple Leafs favour is that they already have Schultz’s former Wisconsin teammate, Jake Gardiner. Apparently the two are quite good friends and Gardiner may be able to convince him that Toronto is a good place to play. One thing working against the Leafs is that they have a crowded blueline, at least at the moment. If Schultz is looking to step in right away Edmonton is probably a better fit. However, Gardiner was down on the Leafs depth chart heading into the season, and the Leafs scratched Cody Franson and put Keith Aulie in the minors to make room for Gardiner after an excellent camp. Burke can cite this as a reason why a full depth chart shouldn’t scare Schultz away from Toronto. More importantly, after a year in which the team gave up a ton of goals, the blueline is probably in for an overhaul this summer, which would open up a spot for Schultz. Right now, the three defenceman most likely to start the season for Toronto are Dion Phaneuf, John-Michael Liles (because he just signed an extension), and Gardiner. There are no real guarantees apart from those three, and even Gardiner could see his name dangled in trade talks if the Leafs are serious about obtaining a No. 1 centre. Burke will try anything possible to rid himself of Mike Komisarek, while Luke Schenn, Cody Franson, and Carl Gunnarsson could all be potential trade bait as well. At this point, no one really knows where Schultz will sign, and anyone who says he is leaning one way is just making an educated guess. It’s highly probable that every team will make an offer to Schultz, although some teams will pursue him more doggedly than others. What is known, however, is that whoever lands Justin Schultz is getting one hell of a steal. Ever been to Edmonton Matt? I seriously doubt it based on the sweeping generalizations in this post. Its about winning and if i'm Justin Schultz, the Oilers are on the top of the list - young, skilled and in need of a top 4 defenseman. My money says he'll go to Edmonton before he goes to Toronto! The only notable UFA Edmonton has signed in the last 20 years is Sheldon Souray. And that was only because they overpayed out of the wazoo, and he wasn't even that desirable. If money is equal, Edmonton just isn't the top choice, sorry. Not saying Toronto is, just hoping. Let's try this again...shall we? Its about WINNING! Nobody's arguing that the Oilers have had trouble signing UFAs since the Gretzky/Messier era ended but the reason is the team has wandered in the darkness for the last 20 years. Its the flippant comments of Toronto bloggers about Edmonton being some kind of hell hole that irritates the crap out of me. If you're going to make such sweeping generalizations you owe it to your readers to actually visit the city before trash talking it. I was trying to keep it focused on the facts. But since you insist, I've been to Edmonton, it sucked. Couldn't get out of there fast enough. So if it's about winning why would he go to a team that hasn't been able to pull itself out of the lottery in years? If it's about winning he'll go to a team that is already winning, not one that might sometime soon. Cuz he instantly gets a top 4 spot and becomes yet another franchise player in a team that will contend for a Cup in 2-3 years. Thats why. Please tell me what notable free agent the leafs have signed????? You really think players sign in Detroit because of the city? Players go to teams that have a chance at winning. Historically, the Leafs haven't done an amazing job of attracting free agents to Toronto, but a hell of a lot better than Edmonton. Signing Curtis Joseph from Edmonton being the biggest one. Edmonton has signed literally nobody of consequence in the last 20 years. And Edmonton needs to start winning before selling free agents at a chance to win. Maybe 2,3,4 years down the road things will be different when Hall, Eberle, RNH have developed into the players everyone hopes they will. But right now, when Schultz is signing, the Oilers are selling hope, not a chance at winning.